Meet and mingle with your local Chambers! This collaboration with the Gallatin, Mt. 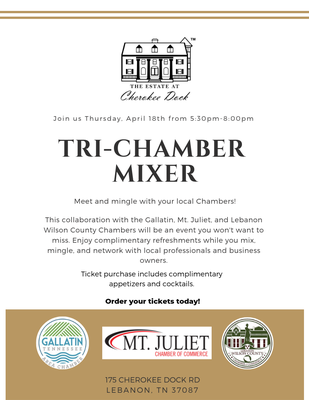 Juliet, and Lebanon Wilson County Chambers will be an event you won't want to miss! The Estate at Cherokee Dock will be hosting the Tri-Chamber Mixer - Be sure to purchase your ticket and join us!